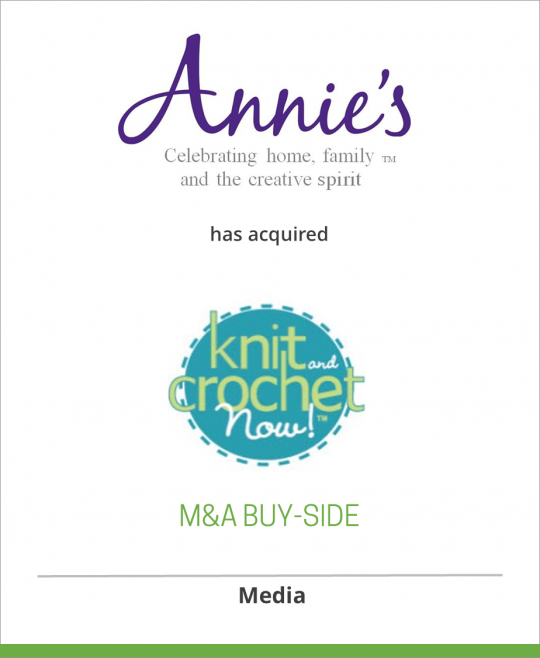 DeSilva+Phillips announces that our client Annie’s, a leader in the crafts market, has acquired Candice Jensen Productions, creators of the popular PBS show, Knit and Crochet Now! The move further establishes Annie’s as one of the largest and most diverse sources of craft designs and instruction in the U.S., with five magazines (Crochet World, Creative Knitting, Crochet!, Quilter’s World and CardMaker), three catalogs (Annie’s Crochet & Crafts Catalog, Annie’s Knit & Yarn Catalog and Annie’s Quilt & Sew Catalog), a variety of craft kit clubs, scores of new books published each year, 41 websites, and a strong presence on newsstands and in craft retailers across the country. Annie’s is part of the third-generation Muselman family business based in Berne, Ind., near Fort Wayne. In just four years, Emmy-nominated Knit and Crochet Now! has catapulted to the top of the PBS roster of knitting and crochet shows. A popular knit and crochet designer, Candi has over 400 designs published in national magazines, including Better Homes & Gardens, Good Housekeeping, Women’s Day, Family Circle, Vogue Knitting, Interweave Knits and Interweave Crochet. As a recognized expert on knitting and crochet, she has been tapped numerous times for her expertise on national television (Good Morning America, Carol Duval Show, Knitty Gritty), and is the author of 14 books. “I’m thrilled to be working with Annie’s on Knit and Crochet Now!. They have the expertise and vision to take the television show to the next level, and I know the viewers across the country will be overjoyed with the results,” Jensen said. Each episode of Knit and Crochet Now! features host Brett Bara and a team of knitting and crochet experts. Kristin Nicholas and Maggie Pace cover the knitting side, and Robyn Chachula and Drew Emborsky teach crochet techniques. In every episode, the experts demonstrate at least one knit and one crochet project, with patterns that range from afghans to sweaters and baby items to home decor. Every episode also features an interview with an industry great. Past shows have included segments with Kaffe Fassett, Debbie Stoller, Mari Lynn Patrick, Debbie Macomber, the gang from Ravelry and the founder of Etsy. A full 26-episode season will be in production this fall for release in spring 2013. Annie’s (Annies-Publishing.com) is part of the third-generation Muselman family business headquartered in Berne, Ind., near Fort Wayne. It is well known to crafters and nostalgia buffs for its print and digital magazines, pattern books and other related products, sold primarily via mail, websites and catalogs. The Muselman business began in 1925 with the founding of Economy Printing Concern in Berne. EP Graphics, as it is known today, is still owned by the Muselman family. It specializes in high-quality, four-color web printing for catalogs and magazines.